WP Engine is one of the top contenders when it comes to managed WordPress hosting. Whether you are starting your own blog, running a personal food blog or overlooking a complex multi-site installation, WP Engine has all the right features to cater to your site’s every hosting need. The latest caching technology paired with page performance data helps you stay on top of things from a speed optimization standpoint. WP Engine is one of the largest companies in the world that offers WordPress solutions. On their website, they proudly list big-name customers such as Foursquare, Google, GAP, Asan, Twilio, and Soundcloud, all of which rely on solutions provided by WP Engine. WP Engine is probably best-known for providing advanced hosting services, technical support, and security for WordPress websites. WP Engine was founded in Austin, Texas, in 2010 by Ben Metcalfe, Cullen Wilson, and Jason Cohen although their headquarters are now in London, Britain. The company now has a new CEO (Heather Brunner, formerly the CTO or Chief Technical Officer for WP Engine), but Jason Cohen remains with the company as CTO. WP Engine is considered a “start-up” because it has received venture capital financing across nine different rounds in excess of $290 million from a variety of investors, including Silver Lake Partners, North Bridge Venture Partners, and Silverton Partners. WP Engine prides itself on its diversity, boasting that two-thirds of its management is female, 29 percent of their employees are “non-white ethnicity,” and a third of their staff have never attained a college degree. Their “about” page also proudly lists their company values such as being “grateful” for their role in the lives of their customers, a desire to achieve financial profitability, and forgiving one another for making mistakes. WP Engine offers StudioPress themes built on their Genesis framework, a plug-in for one-click migration, custom plugins, and SSL and CDN certificates. WP Engine also promises 24-hour customer service 365 days from their two customer service centers in America and Ireland that are staffed by WordPress experts. WP Engine also offers cloud storage solutions provided by Amazon Web Services (AWS) and Google which allows WP Engine to offer a scalable architecture to quickly and automatically ramp up service for websites that see big spikes in visitor traffic. 30% off on WP Engine! The WP Engine Personal plan starts at $35 per month which is great for single site installations or for developers who’d like to try out WP Engine’s hosting services risk-free for 60 days. When you’re ready to take things further then the hosting provider also offers Professional, Business, Premium, and Enterprise Grade plans. Due to their very popular affiliate program that encourages hyperbolic, gushingly positive reviews, it’s a little difficult to separate the hype from reality when it comes to WP Engine. The company is clearly a Silicon Valley darling that has benefited from multiple rounds of VC funding and working relationships with other big-name start-up companies, but the plain truth is that WP Engine is just one amongst many other firms that offer migration assistance, technical assistance, and “hosting” for WordPress websites. WP Engine promotes itself as a trusted and reliable solution for medium to bigger WordPress websites that need more than what basic / cheap hosting companies like Bluehost can provide. WP Engine boasts of a highly competent tech team that can handle complex migrations (i.e. moving your site from its current host to WP Engine) and configuring scripts and plugins. WP Engine also promises state-of-the-art tech and responsive servers to make websites load very quickly. WP Engine also bills itself as a one-stop shop where customers can relax and let WP Engine handle all of the technical issues, including updates and protection from malicious attacks. And while WP Engine does offer a “start-up” plan for smaller websites at just $35/month, it’s clear that their primary focus is on high-traffic websites and enterprise solutions for larger companies. In addition, WP Engine does not sell domains. And rather oddly, WP Engine does not offer an email address but instead advises customers to link their accounts to a Gmail email address. All the above being said, WP Engine has a positive reputation for responsive customer service, including 24-hour phone support. Their specialty in handling complex websites that run a lot of scripts and plugins is also of value to bigger companies or for-profit bloggers that want to hand off the day-to-day administration of the technical side of running a WordPress site. And it’s likely that bigger companies with a lot of clout do quite well with WP Engine thanks to a dedicated project manager. What Type of WordPress Sites Can Benefit From Hosting With WP Engine? If you’re just starting out as a WordPress administrator, WP Engine is almost definitely not what you need. 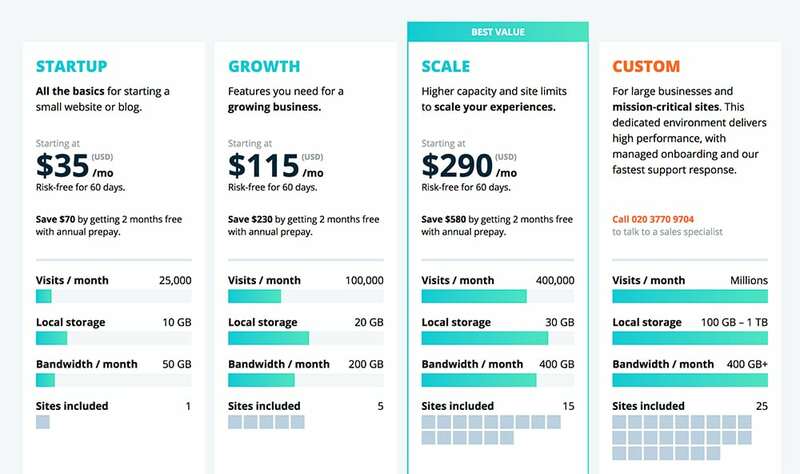 For simpler websites without a lot of traffic, there are many companies offering basic hosting services for less than half the cost of WP Engine’s cheapest plan ($35/month). However, if you are running a medium to large blog or WordPress website, and you want someone to handle all of the technical aspects for you, including migration, then WP Engine might be right for you. By choosing WP Engine to “host” your website, you’ll be handing over all of the technical reigns to their team, allowing them to install custom security features such as completing CAPTCHAs to leave a comment and two-factor authorization for administrators. WP Engine also uses staging environments or a kind of “virtual space” where modifications can be made and tested before being applied to the website. WP Engine also consistently gets high marks from satisfied customers for their fast loading time. WP Engine also provides image caching on the front end in order to help speed up response time. And WP Engine offers very pro-active security services to protect against DDoS attacks and other malicious activity. WP Engine exclusively “hosts” WordPress sites, but they do offer assistance in transferring a non-WordPress website to a WordPress one which can be a huge benefit to some companies or businesses. WP Engine also helps preserve SEO rankings with a simple GUI tool to handle redirects. WP Engine also automatically creates “restore points” or back-up copies of the working website every time a change is made so that the site can always be “rolled back” to a previous build. WP Engine also offers very generous payments for their affiliate program and reseller partner program (see below), so existing customers can sometimes turn a nice profit or effectively receive free hosting by choosing WP Engine to manage their website. And it’s definitely worth noting that many of WP Engine’s most satisfied customers really appreciate the company’s customer service. In summary, if you have a for-profit complex website with a lot of traffic, and you absolutely do not want to handle anything technical (including security and updates), WP Engine might be the perfect company to meet your needs. WP Engine also regularly promotes its services by offering coupons for a reduced price on one of their plans. Using this link will give you 30 percent off (or similarly attractive deals) for customers who pre-pay for a full year of service. These coupons are definitely authentic. Also note that this link is part of WP Engine’s affiliate program, meaning that makeawebsitehub.com earns money when the coupon is redeemed. This does not effect the price. You still get the great discount. Redeeming a WP Engine coupon is quite simple. Click through on this coupon link. Keep in mind that you’ll be required to sign up for a “hosting” plan and provide your credit card information in order to redeem the coupon. WP Engine offers full refunds for all plans within 60 days of opening an account. For years, WP Engine has operated one of the most lucrative affiliate programs in the WordPress world. They pay $200 for every new customer or 100 percent of the first monthly payment, whichever is higher. Considering that the lowest-price plan goes for $35 a month, this effectively means that an affiliate will take half the yearly earnings for signing up a new customer for the basic plan. WP Engine also permits sub-affiliates that also earn $50 per new customer, so there are lots of positive reviews of WP Engine on the internet. And WP Engine also offers bonuses for affiliates who make five or more sales per month. Effectively, existing WP Engine customers can often pay for their WP Engine fees simply by signing up enough new people.